Mail is the English word, derived from the French 'maglia' via the Latin 'macula' which means 'net'. Looking at the stuff it is obvious why it should be called a net. There is currently a pretentious tendency to try and adopt a falsely anachronistic use of a medieval spelling, 'maille' which is unnecessary. The creators of the would-be modern knights/musketeers do like their jargon. Despite the essentially simple manufacture and structure of mail there is a wealth of confusion about what it is. Take a look - or rather, don't - at TV Vikings and you will see a wide range of plaited leather and rivets combined with abbatoir-workers gear and kevlar masquerading as armour. See below how far TV and film armour has come in 45 years. The colour stills are from HBO Vikings 2014. The monochrome from 'Alfred the Great ' 1969. A useful summary of the cloud of confusion is provided HERE. The main point to remember is that mail is made of iron rings rivetted together and is not available in a variety of structures or types. Mail is mail. We have a very limited range of evidence for mail in the Viking Age. The circumstantial evidence is high that the warrior class would have owned and used mail. Poems from the Norse and parallels with the societies they were in contact with, point to the existence of mail. The mail we have from finds is either alternate rows of flat, square section punched rings and round rivetted rings, or all-rivetted round-wire construction. There is a tendency to all-rivetted construction into the middle-ages. The usual garment is a shirt with sleeves to the elbow or longer and a length down to the thigh or knee. We have no evidence for small pieces applied to leather or individual protections for arms or legs or crotch. The garment was taken off over the head and had no 'seams' or side openings an dno attached 'mittens' of mail. The mail shirt could be blackened or blued to protect against rust or it could be maintained brightly polished. Beautiful finds from Ostrow Lednice Lake, Poland. Maybe from c.1038AD. 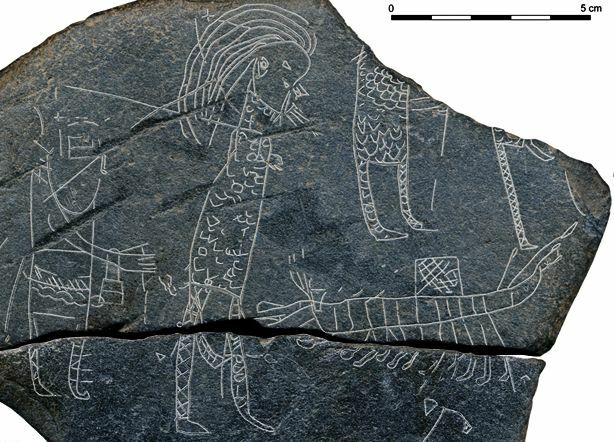 Although dramatically dubbed 'The Hostage Stone' this inscribed slate from a monastic workshop on Bute , dated to 8th-9th centuries, may show the transport of a saint's relics, guarded by armed men. The warriors have long hair and seem to wear mail shirts - unless anyone would like to argue for overlapping scales ? - by virtue of the ornament inscribed. 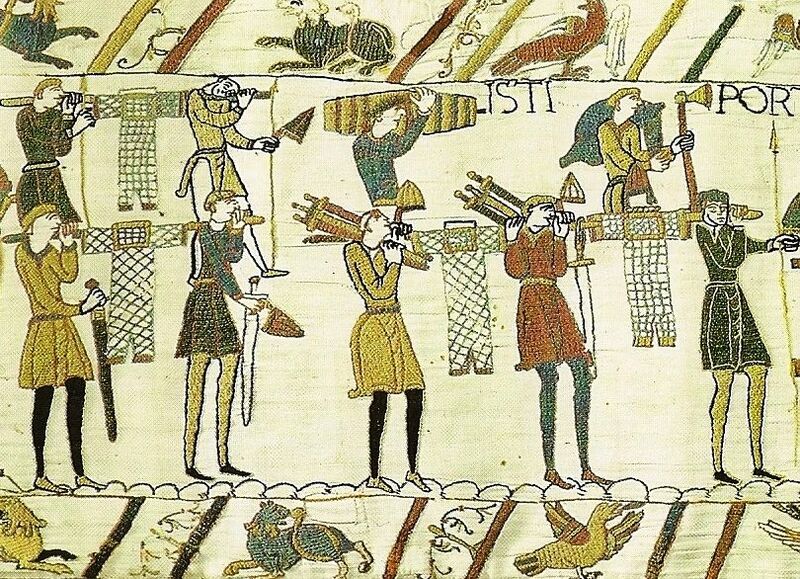 The legs of the warriors show cross-gartering or leg bandages usual at the time. Seemingly, three warriors are shown alongside an oared ship with maybe a sail. Those favouring the 'hostage' interpretation have to account for how the artist would have viewed this scene if he was a monk on a small island in the Firth of Clyde. The line over the shoulder of the leftmost warrior seems to echo the vertical line near the middle warrior, which would argue that they are both carrying spears. Why would a captive monk, carrying precious booty, be led by a loop on a stick when he is already supposedly chained ? There are a surprising number of fragmentary mail finds when one starts to look in reports and books on excavations. Single links or small pieces do not get a big press but they occur in area excavations and in graves. Mail rusts and can totally disappear in damp or acid ground. It may be suggested that if the mail shirt was a very useful and very expensive item then it was saved for the living and a token or pars pro toto offering made instead. A practical consideration may also be - how easy is it to get a stiff, smelly corpse into a mail shirt? Much better to dress it in fine clothes and let the mail prolong someone else's life. Gjermundbu mail shirt remains and the helmet with an attached ring visible at left. 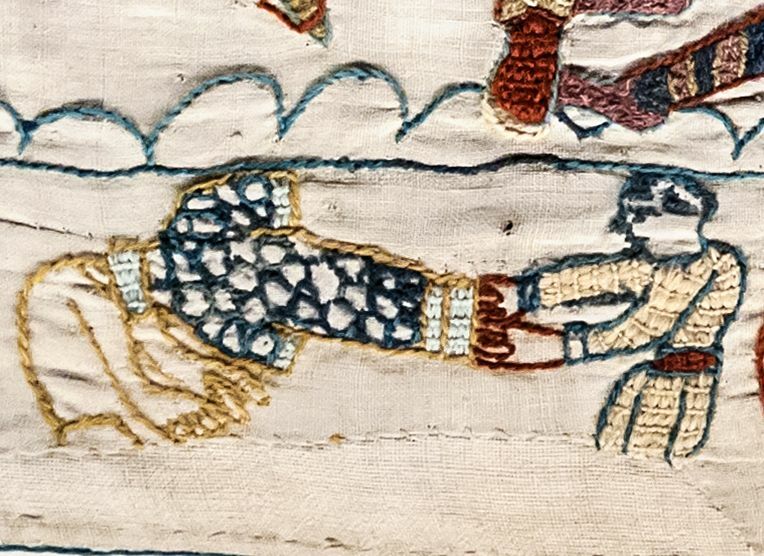 The mail-clad figures from the Bayeaux tapestry are well known. The 'rousered' appearance is a topic for discussion of itself, but suffice to say it is generally regarded as a misapprehension by the artist. Dead men are shown having mail shirts dragged off over their heads so the artist also appreciates there can be no crotch-piece in the garment. The majority of figures have fore-arm-length sleeves and knee-length hems on their mail shirts. A few special riders appear to have mail hose. The shirts can be seen hanging from poles as they are loaded onto the invasion fleet. The general impression is of a warrior class armed to the teeth and well protected. 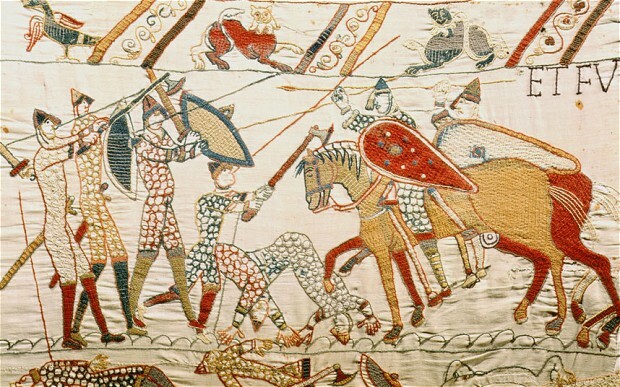 An exception is a group of English who are are shown without armour defending a hill and getting the worst of it and the archers of both sides. 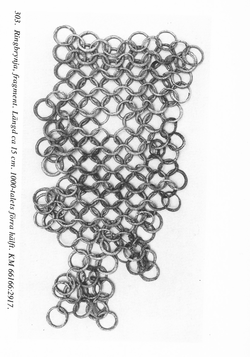 As Ewart Oakeshot observed , many years ago, as long as iron mail functioned it would be used - he found a Viking Age shirt which had been used into the fifteenth century - and when it was no longer needed it could easily be recycled by a smith into a pot or it could be left to rust to nothing. It is not surprising we have few remains. A parallel is the arrow and bow of the famous English yeoman archer. These wooden items could be burnt when finished with or rotted to nothing, We have a single arrow remaining from the heyday of the longbow and no bow staves at all. The Inchmarnock stone. Chained and padlocked captive or V.I.P. with his guards? 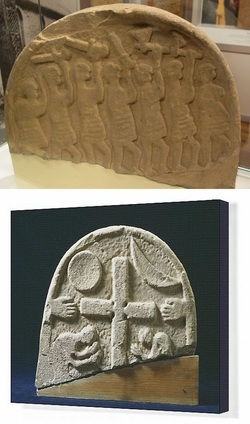 From Holy Island in Northumbria we have a Christian grave marker from the ninth century - according to English Heritage. 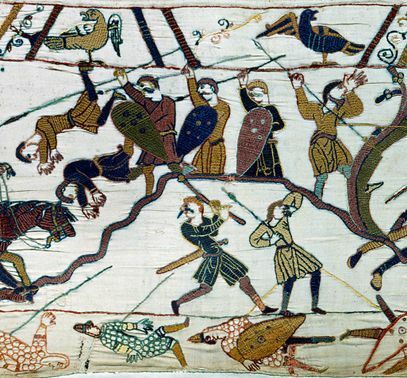 In othe rplaces they woul dhave us believe it was made to commemorate the dead of the 793AD raid bewailed by Alcuin. The other side shows usual Christian motifs so maybe the reverse does show Armageddon. In any case we have some nice warriors with what appears to be mail shirts - th erows of links nicely depicted. The stone would also have been gessoed and painted. As with the Inchmarnock stone there are no shields but there are some vicious looking swords and axes. Mail from town excavations in Lund, Skåne. First half of 11th century. Classic rivetted mail. There was enough of it about to lose pieces, apparently. The Gjermundbu find from Norway is the only find of what could be called a mail shirt dateable to the Viking Age within Scandinavia. It is made of alternate punched and rivetted rings. The surviving quantity woul donly make a small 'vest' but maybe the whole thing was not deposited. Mail was apparently used on a ventail for the accompanying helmet. If you want to go into the details of the mail's manufacture you can start HERE. Doing their job with appropriate work-wear. Mail shirts with split skirts being loaded. No mail here. Textiles dying and showing despair. In summary. Mail armour of the Viking Age was made as a shirt which was put on and off over the head. It was not combined with leather or plates. It was an effective, flexible, durable protection. 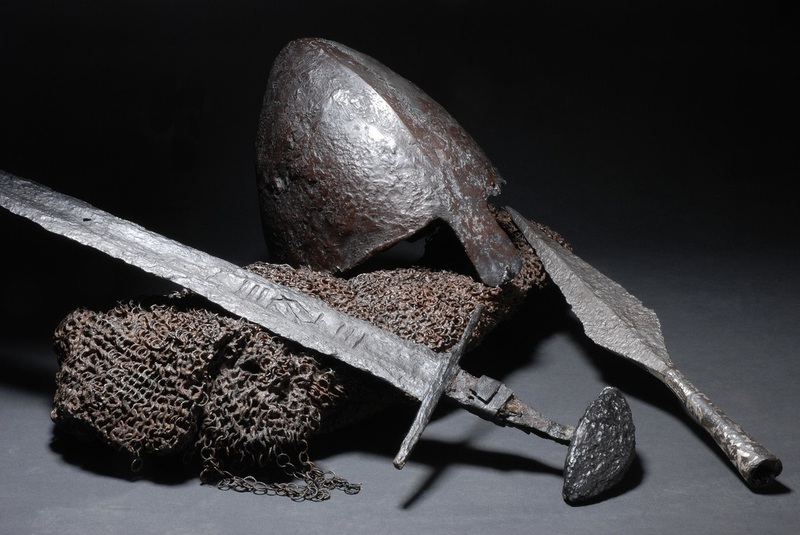 Most men who were members of the fighting class would probably have had one, and this was even more likely in the 'Second' Viking Age of warring kings.